libraryDependencies += "com.typesafe.akka" %% "akka-persistence" % "2.5.20"
When working on long running projects using Persistence, or any kind of Event Sourcing architectures, schema evolution becomes one of the more important technical aspects of developing your application. The requirements as well as our own understanding of the business domain may (and will) change in time. In fact, if a project matures to the point where you need to evolve its schema to adapt to changing business requirements you can view this as first signs of its success – if you wouldn’t need to adapt anything over an apps lifecycle that could mean that no-one is really using it actively. In this chapter we will investigate various schema evolution strategies and techniques from which you can pick and choose the ones that match your domain and challenge at hand. This page proposes a number of possible solutions to the schema evolution problem and explains how some of the utilities Akka provides can be used to achieve this, it is by no means a complete (closed) set of solutions. Sometimes, based on the capabilities of your serialization formats, you may be able to evolve your schema in different ways than outlined in the sections below. If you discover useful patterns or techniques for schema evolution feel free to submit Pull Requests to this page to extend it. In recent years we have observed a tremendous move towards immutable append-only datastores, with event-sourcing being the prime technique successfully being used in these settings. For an excellent overview why and how immutable data makes scalability and systems design much simpler you may want to read Pat Helland’s excellent Immutability Changes Everything whitepaper. Since with Event Sourcing the events are immutable and usually never deleted – the way schema evolution is handled differs from how one would go about it in a mutable database setting (e.g. in typical CRUD database applications). The system needs to be able to continue to work in the presence of “old” events which were stored under the “old” schema. We also want to limit complexity in the business logic layer, exposing a consistent view over all of the events of a given type to PersistentActor s and persistence queries. This allows the business logic layer to focus on solving business problems instead of having to explicitly deal with different schemas. Before we explain the various techniques that can be used to safely evolve the schema of your persistent events over time, we first need to define what the actual problem is, and what the typical styles of changes are. Since events are never deleted, we need to have a way to be able to replay (read) old events, in such way that does not force the PersistentActor to be aware of all possible versions of an event that it may have persisted in the past. Instead, we want the Actors to work on some form of “latest” version of the event and provide some means of either converting old “versions” of stored events into this “latest” event type, or constantly evolve the event definition - in a backwards compatible way - such that the new deserialization code can still read old events. split event into multiple smaller events. The following sections will explain some patterns which can be used to safely evolve your schema when facing those changes. Picking the serialization format is a very important decision you will have to make while building your application. It affects which kind of evolutions are simple (or hard) to do, how much work is required to add a new datatype, and, last but not least, serialization performance. If you find yourself realising you have picked “the wrong” serialization format, it is always possible to change the format used for storing new events, however you would have to keep the old deserialization code in order to be able to replay events that were persisted using the old serialization scheme. It is possible to “rebuild” an event-log from one serialization format to another one, however it may be a more involved process if you need to perform this on a live system. Binary serialization formats that we have seen work well for long-lived applications include the very flexible IDL based: Google Protobuf, Apache Thrift or Apache Avro. Avro schema evolution is more “entire schema” based, instead of single fields focused like in protobuf or thrift, and usually requires using some kind of schema registry. Users who want their data to be human-readable directly in the write-side datastore may opt to use plain-old JSON as the storage format, though that comes at a cost of lacking support for schema evolution and relatively large marshalling latency. There are plenty excellent blog posts explaining the various trade-offs between popular serialization formats, one post we would like to highlight is the very well illustrated Schema evolution in Avro, Protocol Buffers and Thrift by Martin Kleppmann. Akka Persistence provides Google Protocol Buffers based serializers (using Akka Serialization) for it’s own message types such as PersistentRepr, AtomicWrite and snapshots. Journal plugin implementations may choose to use those provided serializers, or pick a serializer which suits the underlying database better. Serialization is NOT handled automatically by Akka Persistence itself. Instead, it only provides the above described serializers, and in case a AsyncWriteJournal plugin implementation chooses to use them directly, the above serialization scheme will be used. Please refer to your write journal’s documentation to learn more about how it handles serialization! For example, some journals may choose to not use Akka Serialization at all and instead store the data in a format that is more “native” for the underlying datastore, e.g. using JSON or some other kind of format that the target datastore understands directly. 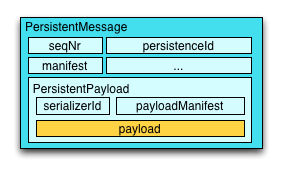 Akka Persistence provided serializers wrap the user payload in an envelope containing all persistence-relevant information. If the Journal uses provided Protobuf serializers for the wrapper types (e.g. PersistentRepr), then the payload will be serialized using the user configured serializer, and if none is provided explicitly, Java serialization will be used for it. The blue colored regions of the PersistentMessage indicate what is serialized using the generated protocol buffers serializers, and the yellow payload indicates the user provided event (by calling persist(payload)(...)persist(payload, ...)). As you can see, the PersistentMessage acts as an envelope around the payload, adding various fields related to the origin of the event (persistenceId, sequenceNr and more). More advanced techniques (e.g. Remove event class and ignore events) will dive into using the manifests for increasing the flexibility of the persisted vs. exposed types even more. However for now we will focus on the simpler evolution techniques, concerning only configuring the payload serializers. By default the payload will be serialized using Java Serialization. This is fine for testing and initial phases of your development (while you’re still figuring out things and the data will not need to stay persisted forever). However, once you move to production you should really pick a different serializer for your payloads. Do not rely on Java serialization (which will be picked by Akka by default if you don’t specify any serializers) for serious application development! It does not lean itself well to evolving schemas over long periods of time, and its performance is also not very high (it never was designed for high-throughput scenarios). This section aims to highlight the complete basics on how to define custom serializers using Akka Serialization. Many journal plugin implementations use Akka Serialization, thus it is tremendously important to understand how to configure it to work with your event classes. Read the Akka Serialization docs to learn more about defining custom serializers, to improve performance and maintainability of your system. Do not depend on Java serialization for production deployments. The below snippet explains in the minimal amount of lines how a custom serializer can be registered. For more in-depth explanations on how serialization picks the serializer to use etc, please refer to its documentation. * Simplest possible serializer, uses a string representation of the Person class. * to perform the actual to/from bytes marshalling. "Unable to deserialize from bytes, manifest was: "
+ "! Bytes length: "
Deserialization will be performed by the same serializer which serialized the message initially because of the identifier being stored together with the message. Please refer to the Akka Serialization documentation for more advanced use of serializers, especially the Serializer with String Manifest section since it is very useful for Persistence based applications dealing with schema evolutions, as we will see in some of the examples below. In this section we will discuss various schema evolution techniques using concrete examples and explaining some of the various options one might go about handling the described situation. The list below is by no means a complete guide, so feel free to adapt these techniques depending on your serializer’s capabilities and/or other domain specific limitations. Situation: You need to add a field to an existing message type. For example, a SeatReserved(letter:String, row:Int)SeatReserved(String letter, int row) now needs to have an associated code which indicates if it is a window or aisle seat. Solution: Adding fields is the most common change you’ll need to apply to your messages so make sure the serialization format you picked for your payloads can handle it apropriately, i.e. such changes should be binary compatible. This is achieved using the right serializer toolkit – we recommend something like Google Protocol Buffers or Apache Thrift however other tools may fit your needs just as well – picking a serializer backend is something you should research before picking one to run with. In the following examples we will be using protobuf, mostly because we are familiar with it, it does its job well and Akka is using it internally as well. While being able to read messages with missing fields is half of the solution, you also need to deal with the missing values somehow. This is usually modeled as some kind of default value, or by representing the field as an Option[T]Optional<T> See below for an example how reading an optional field from a serialized protocol buffers message might look like. * to perform the to/from binary marshalling. Situation: When first designing the system the SeatReserved event featured a code field. After some time you discover that what was originally called code actually means seatNr, thus the model should be changed to reflect this concept more accurately. Solution 1 - using IDL based serializers: First, we will discuss the most efficient way of dealing with such kinds of schema changes – IDL based serializers. IDL stands for Interface Description Language, and means that the schema of the messages that will be stored is based on this description. Most IDL based serializers also generate the serializer / deserializer code so that using them is not too hard. Examples of such serializers are protobuf or thrift. It is important to learn about the strengths and limitations of your serializers, in order to be able to move swiftly and refactor your models fearlessly as you go on with the project. Learn in-depth about the serialization engine you’re using as it will impact how you can aproach schema evolution. Some operations are “free” in certain serialization formats (more often than not: removing/adding optional fields, sometimes renaming fields etc. ), while some other operations are strictly not possible. Solution 2 - by manually handling the event versions: Another solution, in case your serialization format does not support renames like the above mentioned formats, is versioning your schema. For example, you could have made your events carry an additional field called _version which was set to 1 (because it was the initial schema), and once you change the schema you bump this number to 2, and write an adapter which can perform the rename. This approach is popular when your serialization format is something like JSON, where renames can not be performed automatically by the serializer. You can do these kinds of “promotions” either manually (as shown in the example below) or using a library like StaminaStamina which helps to create those V1->V2->V3->...->Vn promotion chains without much boilerplate. As you can see, manually handling renames induces some boilerplate onto the EventAdapter, however much of it you will find is common infrastructure code that can be either provided by an external library (for promotion management) or put together in a simple helper traitclass. The technique of versioning events and then promoting them to the latest version using JSON transformations can be applied to more than just field renames – it also applies to adding fields and all kinds of changes in the message format. Situation: While investigating app performance you notice that insane amounts of CustomerBlinked events are being stored for every customer each time he/she blinks. Upon investigation you decide that the event does not add any value and should be deleted. You still have to be able to replay from a journal which contains those old CustomerBlinked events though. The EventAdapter can drop old events (**O**) by emitting an empty EventSeq. Other events can be passed through (**E**). This however does not address the underlying cost of having to deserialize all the events during recovery, even those which will be filtered out by the adapter. In the next section we will improve the above explained mechanism to avoid deserializing events which would be filtered out by the adapter anyway, thus allowing to save precious time during a recovery containing lots of such events (without actually having to delete them). first, that the deserialization was actually performed, so we spent some of out time budget on the deserialization, even though the event does not contribute anything to the persistent actors state. second, that we are unable to remove the event class from the system – since the serializer still needs to create the actual instance of it, as it does not know it will not be used. The solution to these problems is to use a serializer that is aware of that event being no longer needed, and can notice this before starting to deserialize the object. The serializer is aware of the old event types that need to be skipped (**O**), and can skip deserializing them altogether by returning a “tombstone” (**T**), which the EventAdapter converts into an empty EventSeq. Other events (**E**) can just be passed through. override def manifest(event: Any) = ""
Situation: You want to separate the application model (often called the “domain model”) completely from the models used to persist the corresponding events (the “data model”). For example because the data representation may change independently of the domain model. Another situation where this technique may be useful is when your serialization tool of choice requires generated classes to be used for serialization and deserialization of objects, like for example Google Protocol Buffers do, yet you do not want to leak this implementation detail into the domain model itself, which you’d like to model as plain Scala caseJava classes. Domain events (**A**) are adapted to the data model events (**D**) by the EventAdapter. The data model can be a format natively understood by the journal, such that it can store it more efficiently or include additional data for the event (e.g. tags), for ease of later querying. override def manifest(event: Any): String = ""
The same technique could also be used directly in the Serializer if the end result of marshalling is bytes. Then the serializer can simply convert the bytes do the domain object by using the generated protobuf builders. Situation: You want to keep your persisted events in a human-readable format, for example JSON. Solution: This is a special case of the Detach domain model from data model pattern, and thus requires some co-operation from the Journal implementation to achieve this. An example of a Journal which may implement this pattern is MongoDB, however other databases such as PostgreSQL and Cassandra could also do it because of their built-in JSON capabilities. In this aproach, the EventAdapter is used as the marshalling layer: it serializes the events to/from JSON. The journal plugin notices that the incoming event type is JSON (for example by performing a match on the incoming event) and stores the incoming object directly. This technique only applies if the Akka Persistence plugin you are using provides this capability. Check the documentation of your favourite plugin to see if it supports this style of persistence. If it doesn’t, you may want to skim the list of existing journal plugins, just in case some other plugin for your favourite datastore does provide this capability. In fact, an AsyncWriteJournal implementation could natively decide to not use binary serialization at all, and always serialize the incoming messages as JSON - in which case the toJournal implementation of the EventAdapter would be an identity function, and the fromJournal would need to de-serialize messages from JSON. If in need of human-readable events on the write-side of your application reconsider whether preparing materialized views using Persistence Query would not be an efficient way to go about this, without compromising the write-side’s throughput characteristics. If indeed you want to use a human-readable representation on the write-side, pick a Persistence plugin that provides that functionality, or – implement one yourself. Situation: While refactoring your domain events, you find that one of the events has become too large (coarse-grained) and needs to be split up into multiple fine-grained events. Solution: Let us consider a situation where an event represents “user details changed”. After some time we discover that this event is too coarse, and needs to be split into “user name changed” and “user address changed”, because somehow users keep changing their usernames a lot and we’d like to keep this as a separate event. The write side change is very simple, we persist UserNameChanged or UserAddressChanged depending on what the user actually intended to change (instead of the composite UserDetailsChanged that we had in version 1 of our model). The EventAdapter splits the incoming event into smaller more fine grained events during recovery. By returning an EventSeq from the event adapter, the recovered event can be converted to multiple events before being delivered to the persistent actor.